The darshan program began the next day at 9:00 a.m. in Guruprasad Hall. We were met and embraced on the steps of the hall by Mani and some of the other mandali. Mani’s eyes are twin disks of light and her embrace is all warmth. One of the members of the darshan group who very recently came to Baba, said that for him the embrace from Mani was the high point of the darshan. He did not even know who Mani was, and yet when they embraced he became flooded with Baba’s love. At Eruch’s direction we sat ourselves inside the hall. Eruch was clearly older than he appeared in even the latest films from India, his hair now graying, and in this I could sense the ordeal of the past few months. 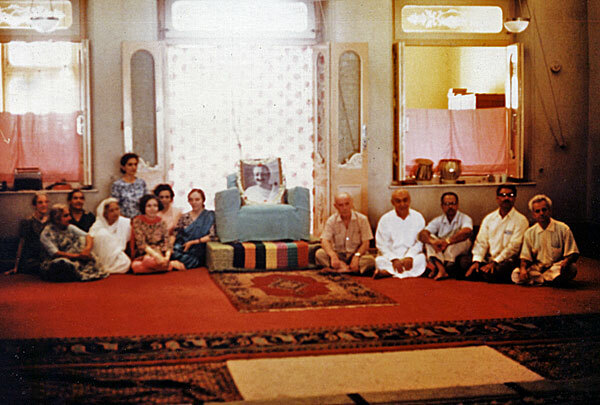 At the head of the hall was Baba’s chair, and placed in it was the photograph of Baba that is in the Universal Message brochure with a garland draped around the picture frame in a heart shape. Upon seeing the chair I felt a definite tinge of disappointment at not seeing Baba in the body, and for that moment he seemed painfully absent. The clock in the hall chimed nine o’clock and Eruch announced, “We have kept an appointment with God,” and that began to bring Baba back. … It was an experience in which all ego seemed to be stripped away by a blast of pure love from Baba’s furnace, and in this intense blaze the heart blossomed like a flower. This is the heart response that many have found with Baba. Once he shows it to us, it is much easier to find anywhere, and in this sense the darshan is continual.